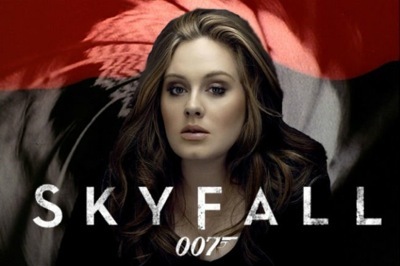 She’s rolling in the deep with 007. Today is Global Bond Day, marking the 50th anniversary of the release of Dr. No. And what better way for the franchise to shake and stir you than with the release of the latest Bond theme, which jetpacks the pop powerhouse behind the albums 19 and 21 into the world of 007? As a Bond theme? I like it. I’d like it more if it were crisper; as I thought our first listen had reached its end I turned to my wife and said “it’s good,” unaware that it was 40 seconds or so from wrapping up. (It’s the third-longest Bond theme, after Gladys Knight’s boring “Licence to Kill,” a snooze for the ears after more than five minutes of repeated “got a licence to kills!,” and Sheryl Crow’s noir-inflected “Tomorrow Never Dies.”) I’m cool with it blending Monty Norman’s classic theme, though if the songstress and co-writer Paul Epworth care Oscar voters frown upon such mix-ins, and, these days, theme songs in general (in simpler times “Live and Let Die,” “Nobody Does It Better,” and “For Your Eyes Only” all received nominations). It signals a return to tradition, after the tomfoolery of Jack White’s Quantum theme “Another Way to Die,” and should fit in fine with the terrific Thomas Newman’s first Bond score, which I’m intrigued to hear. (If cousin Randy had written and performed “Skyfall” you know it would win every movie song award in the book.) Let’s put it this way–if it sets the tone for the movie we’re in good hands. What to do this Global Bond Day after you’ve downloaded “Skyfall” and watched the video? You can preorder Jon Burlingame’s book The Music of James Bond. You can reach into your new “Bond 50” set of Blu-rays and pull out the great, and perennially underrated, On Her Majesty’s Secret Service (1969), composer John Barry’s finest two hours and twenty minutes on the job. Or you can get up early (8:20am EST) and hear me “Bond” with Twin Cities host Dave Lee on “The WCCO Morning News.” I’m not Adele, but like her I get the job done.